Thanks to Muslim’s tradition of observing the Feast of Sacrifice, Monday has been declared a non-working holiday in Manila. Since it will be a long weekend and we both possess multiple entry visas, I and Nengkoy decided to go on a short trip to Osaka, Japan to visit my dear nephew Denden and pretty nieces Erika and Thatcher. This is gonna be the fourth time that I will be travelling with Nengkoy in Japan. However, this will be the first time that only I and my mother will be travelling in tandem, this is because in the past we would usually be accompanied by hordes of members of our family. I don’t know how things would go out. I don’t know who between me and Nengkoy will lose patience first. Members of my family are actually worried. They think our travel tandem is like mixing Skittles and M&Ms in one bowl. Same shapes and colors but totally different whiffs and flavors. Prior to this trip I have been told by my sisters to pack with me oodles of patience, as if I am really to observe the upcoming Muslim’s Feast of Sacrifice. Likewise, my sisters forewarned Nengkoy to completely observe conduct at all times during the duration of the travel if she don’t want to be left right in the middle of the journey. Even if both of us have tremendously fierce personalities, one thing is sure though. This is going to be one fun and memorable voyage. As of this writing, everything seem to be doing well. 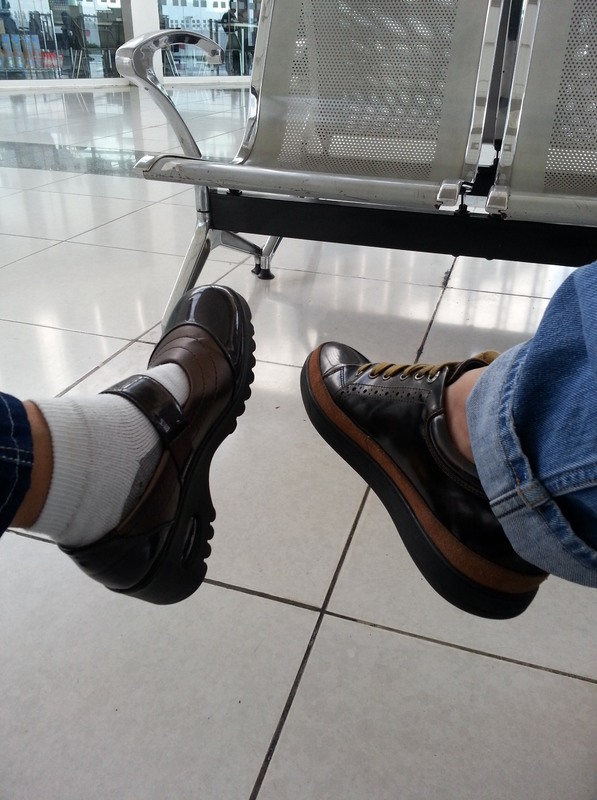 As a proof, here is a photo of our stylish shoe selfie – which by the way has the same color tone – while at the Manila airport waiting to board the plane. Enjoy travelling with Nengkoy, Delicioso!!! Kumbawa!